Death Shadow got reprinted here so doubtful there’s any value even with the uptick in profile and demand. That card was mentioned as an example of a card that was bulk for ages before it was activated. Yes it is. Check the card numbers. Savage land is 243, verdant catacombs is 249. We have scalding tarn, seaside citadel, selesnya Guildgate and simic guildgate revealed. 5 slots 4 cards. Valakut and swampyard are still live. Still watching crucible and chalice, number 218 is interesting. There is also the multi color (non-gold) cards, we could see fulminator mage, kitchen finds or lightning helix. No, only one slot between 240 and 249 unknown. 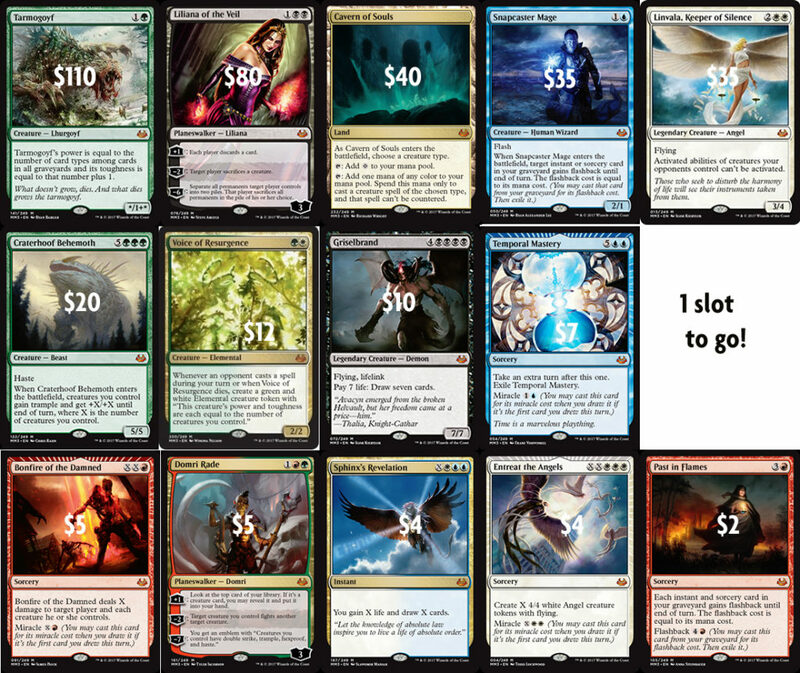 Misty, Orzhov, Rakdos, Savage, Scalding, Seaside, Selesnya, Unknown, Simic, Verdant. Thanks for the info. 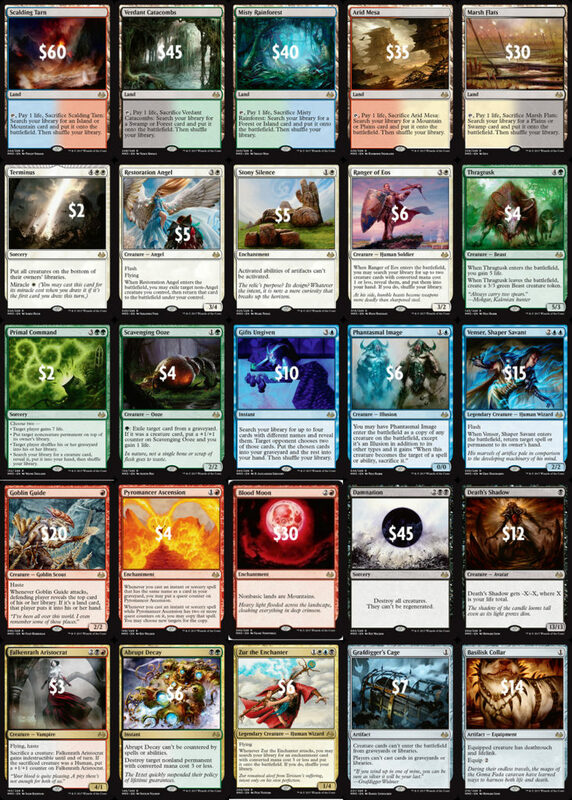 I’m using the Mythic Spoiler page, it does not have numbers 244 thru 248 just the card photos with no numbers. The missing land is number 247 – between Selesnya Guildgate and Simic Guildgate. Therefore, the name of the card will have to start with S.
So yes, Valakut is out. I’d guess for something as unexciting as Shimmering Grotto to help with the mana fixing in limited. Shelldock Isle seems very plausible. Outstanding article, James! Really superior work. Hey James, I want to argue with u regarding the price of a lot of these cards but I can’t fault your math and your work for this article is excellent. There has been a lot of discussion that without a Vegas MM GP there will be a lot more cards in the hands of players and less in the hands of dealers, how do you think not having an MM based GP will affect prices of cards? 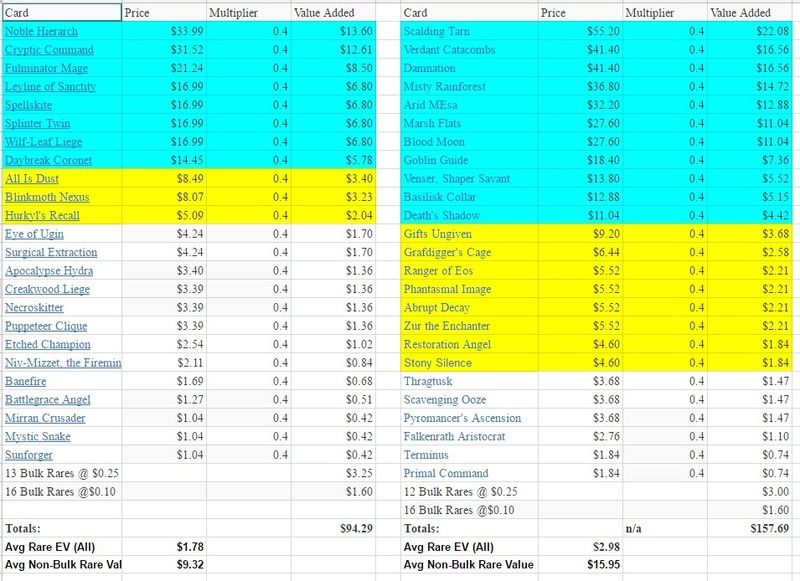 Are Arc bound Ravager and Inkmoth nexus going top $100?!? 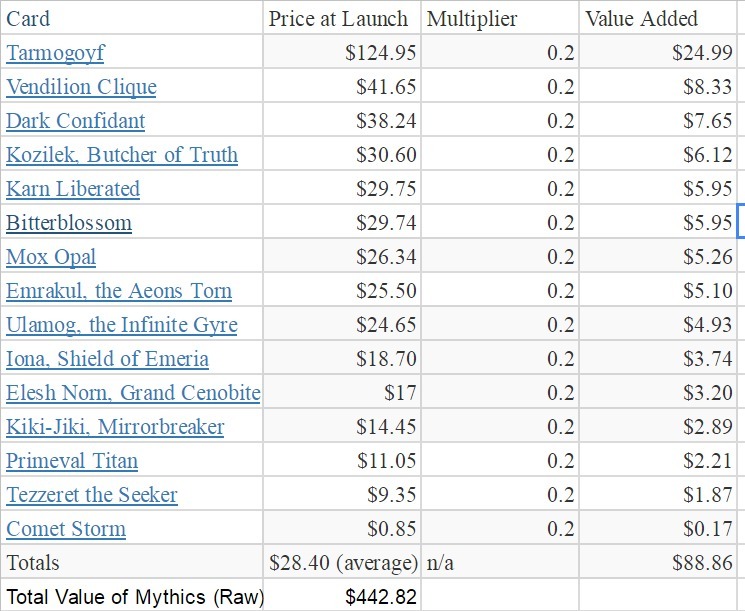 The only thing i’m really concerned with from an investment standpoint is if either Snapcaster or Cavern foils from MM 2017 pull a EMA foil Force impersonation and skyrocket in value. I’m shocked that Star City dropped the price of foil Innistrad Snapcaster to $80, I feel like that’s a bargain and that Snap could be the new Chalice or Noble Hierarch. Any thoughts James? The lack of GPs has allowed WoTC to redirect that inventory to the distributor pipeline. The question then is whether it is an equivalent amount of inventory, or whether the MM17 print run goes far beyond the previous runs, regardless of GP inventory. We won’t know this for sure until more vendor data is acquired and we see how long the set is available to stores, but I’ll say this: good business practices dictate they print what they think they can sell, and given the juice in this set, they likely printed a lot more than we’re used to seeing in the market. Ravager and Nexus are solid targets for the short to mid term, but their destinies are mostly tied to Affinity until the Scales decks put in some camera time. 71% of people I polled preferred the original Snapcaster art, but the bigger issue is whether MM17 will feature FTV or regular foiling. If it’s high gloss again, I wouldn’t touch the foils. Good article. My opinion is that Modern is waaaay too cutthroat to be worth speculating in any way. 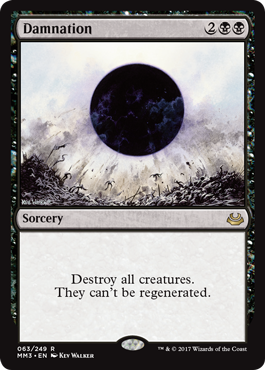 I honestly believe that Legacy would be safer now to focus on opportunities, since the eternal masters effects have largely dissipated. I don’t even focus on modern too much now, and am looking to secure stuff like Jace and perhaps duals now. What are your thoughts on legacy staples as a whole? 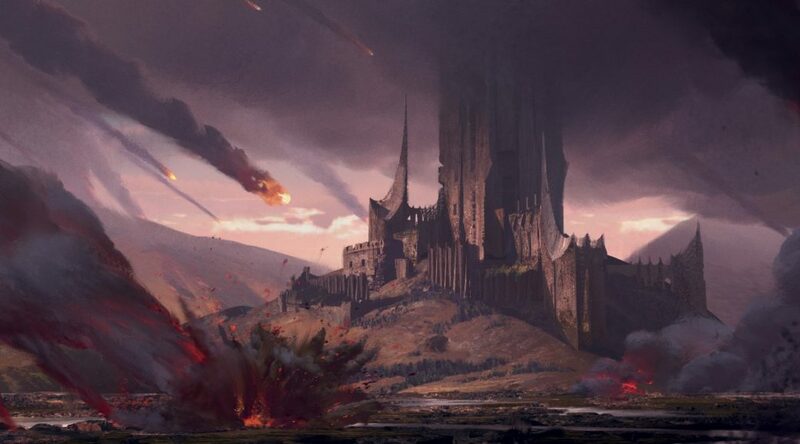 I think the Legacy community is stalled and you want to be putting funds in places that are exhibiting growth. speculation from the “chase rare” lottery system. Ten dollar packs with $ 4 rares & a $2 mythic. No ty. Damnation. Logic, reason, lies & the era of $10 core sets.